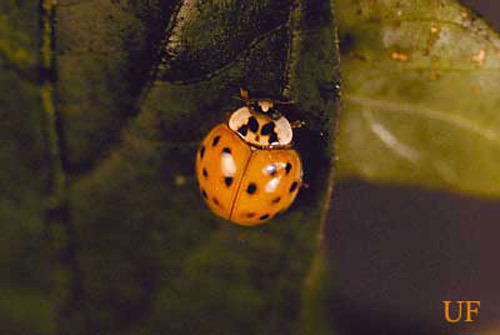 The multicolored Asian lady beetle Harmonia axyridis Pallas was introduced from Asia both purposefully for classical biological control of arthropod pests and accidently into the United States many times during the twentieth century. It finally became established and quickly spread over the entire United States sometime in the late 1980's and early 1990's. Figure 1. Plain orange morph of the multicolored Asian lady beetle, Harmonia axyridis Pallas. Photograph by Russell F. Mizell, University of Florida. Figure 2. Spotted orange morph of the multicolored Asian lady beetle, Harmonia axyridis Pallas. Photograph by Russell F. Mizell, University of Florida. Figure 3. Spotted red morph of the multicolored Asian lady beetle, Harmonia axyridis Pallas. Photograph by Russell F. Mizell, University of Florida. Figure 4. The sevenspotted lady beetle, Coccinella septempunctata Linnaeus. Photograph by Russell F. Mizell, University of Florida. Figure 5. 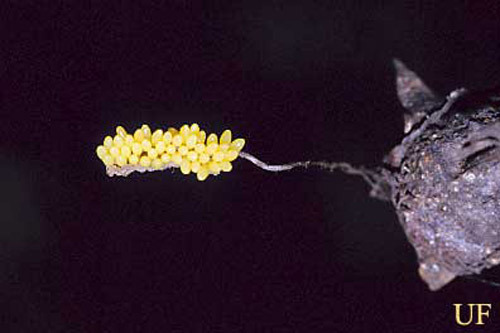 Eggs of the multicolored Asian lady beetle, Harmonia axyridis Pallas. Photograph by Russell F. Mizell, University of Florida. Figure 6. 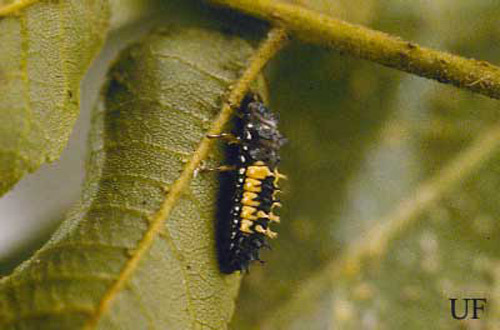 Larva of the multicolored Asian lady beetle, Harmonia axyridis Pallas. Photograph by Russell F. Mizell, University of Florida. Figure 7. 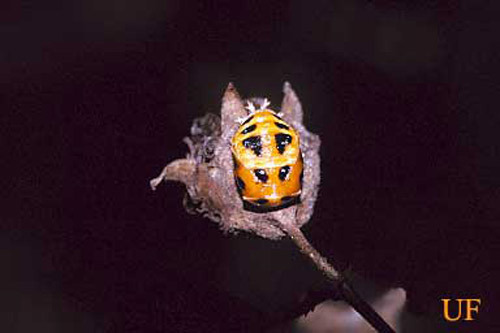 Pupa of the multicolored Asian lady beetle, Harmonia axyridis Pallas. Photograph by Russell F. Mizell, University of Florida. H. axyridis is a voracious predator of arthropod pests such as aphids, mites, thrips, scale and Lepidoptera eggs. As a predator, it is beneficial for most of the year and has contributed to a decrease in pesticide use in a myriad of orchard and other crops. Both H. axyridis larvae and adults feed on pests and quickly build up to large numbers locally. Unfortunately, like many of our native ladybird species, H. axyridis adults aggregate in high numbers to overwinter. 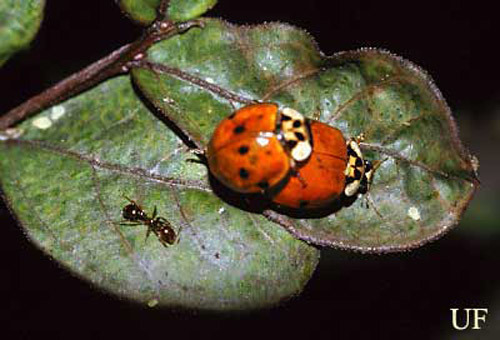 In Japan, H. axyridis overwinter en masse in rocky outcrops on the sides of mountains and in other structures similar to the behavior of the convergent lady beetle, Hippodamia convergens Guérin-Méneville, in the U.S. However, unlike other ladybirds in the U.S., H. axyridis is attracted to light colored dwellings and other manmade objects which it uses as overwintering sites. As a result of this behavior, H. axyridis enters dwellings it is attracted to through cracks, crevices and other small openings around windows, doors and roofs. Flight to overwintering quarters is triggered by the onset of cold weather and scarcity of prey, occurs at different times from year to year, and occurs progressively later from northern to southern latitudes: October in Michigan and November-January in north Florida. These mass migrations to overwintering sites proceed over a period of a few days in the north to a few weeks or more in the southern United States, again dependent on local weather. During the overwintering phenomena, the ladybirds respond to and aggregate in large numbers on dwellings which usually are white, beige or tan, although occasionally darker colored buildings also are used. Usually these dwellings have walls facing in the general directions of south to west which in the fall months due to the sun's lower azimuth are highly reflective of sunlight. These bright reflective surfaces shine intensely and are visible and attractive to the ladybirds from long distances. This is especially true for areas of the United States and Canada which are hilly or mountainous, e.g., Tennessee and New York, where light colored dwellings in the mountains or higher elevations may be visible for miles. As a result of this overwintering behavior, H. axyridis are a nuisance during and after the flight periods as they aggregate in the walls and other parts of dwellings. H. axyridis may enter houses in large numbers, 15,000 to 20,000 is not uncommon. Inside the walls, floors, attics, crawl spaces, etc., of dwellings, they crawl around looking for cool places to spend the winter. 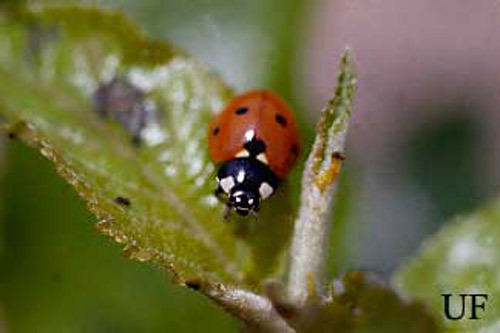 With large numbers of ladybirds, this annoying movement can be heard from inside the house. Moreover, the interior walls of the dwellings are often warmer than the ladybirds require for dormancy. Therefore, they continue to crawl around and often exit the dwelling walls into the interior over the course of the winter or in spring. Once in the warm interior, they fly around and land on walls, drapes, furniture, etc., causing much general annoyance to the human inhabitants. The ladybirds are of special consternation to inhabitants that are entomophobic (fear of insects). H. axyridis also produces a yellow viscous, foul-smelling defensive compound when it is disturbed that may soil whatever it contacts. Therefore, when people disturb them or try to remove them by sweeping, with vacuum cleaners or with other tools, the foul odor spoils the air and yellow spots on people, expensive furniture and drapes result. Figure 8. 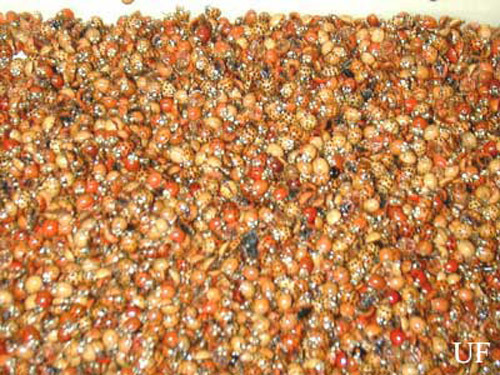 Large number of multicolored Asian lady beetle, Harmonia axyridis Pallas, collected from a building. Photograph by Russell F. Mizell, University of Florida. Recommendations for protecting buildings from overwintering H. axyridis have not been fully developed. All buildings infested by these ladybirds should have any cracks, crevices or holes in the exterior walls and especially around windows and doors sealed or caulked to prevent entry. The ladybirds often enter attics and can accumulate in large numbers in these spaces over the years. Once the ladybirds are inside a building there are several options for removal. The best option is to purchase a black light trap and use it in rooms where ladybirds are observed as soon as they are seen. The light traps when operated at night are very effective. Anonymous. (October 2000). Trapping system for flying insects. USDA, ARS Fact Sheet. 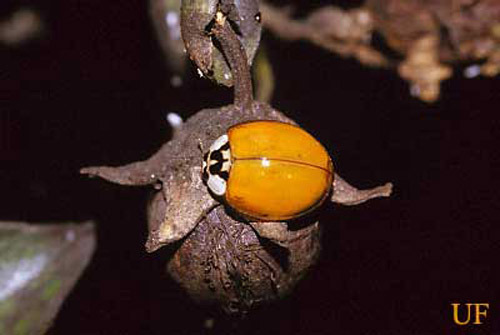 http://www.ars.usda.gov/is/br/lbeetle/001030.trap.pdf (23 March 2001). Chapin JB, Brou VA. 1991. Harmonia axyridis Pallas, the third species of the genus to be found in the United States (Coleoptera: Coccinellidae). Proceedings of the Entomological Society of Washington 93: 630-635. Coderre D, Lucas E, Gagné I. 1995. The occurrence of Harmonia axyridis (Pallas) (Coleoptera: Coccinellidae) in Canada. Canadian Entomologist 127: 609-611. Dreistadt SH, Hagen KS, Bezark LG. 1995. Harmonia axyridis (Pallas) (Coleoptera: Coccinellidae), first western United States record for the Asiatic lady beetle. Pan-Pacific Entomologist 71: 135-136. Jones SC, Boggs J. Multicolored Asian lady beetle. Ohioline. http://ohioline.osu.edu/hse-fact/1030.html (10 July 2002). Nalepa CA, Kidd KA, Hopkins DI. The multicolored Asian lady beetle (Coleoptera: Coccinellidae): orientation to aggregation sites. Journal of Entomological Science 35: 150-157. Obata S. 1986. Determination of hibernation site in the ladybird beetle, Harmonia axyridis Pallas (Coleoptera: Coccinellidae). Kontyu, Tokyo. 54: 218-223. Tangley L. 1999. Ladybug, fly outta my home. U.S. News and World Report. January 25. Tedders WL, Schaefer PW. 1994. Release and establishment of Harmonia axyridis (Coleoptera: Coccinellidae) in the southeastern United States. Entomological News 105: 228-243. Publication Date: March 2001. Latest revision: September 2012.